It takes exactly 13 hours to drive from Roanoke Rapids, North Carolina to Gulfstream Park. In case you were wondering. It’s 3:00 on Friday afternoon and I rejoice at my luck. Spring break has begun; I am in my car; and I’m going to beat rush hour traffic. I am disappointed that the new date for the Florida Derby means that I likely won’t make the race this year, but I am confident that I’ll hit South Florida in time for a post-Derby meal with some racing friends. By 3:45 I am motionless in Staten Island. There is no clear reason why, no accident, but still we sit. An hour later, I hit New Jersey and cruise down the Turnpike; it’s a beautiful day, I’m road-tripping, the music is cranked. Life is good. Until at exit 8A I am once again sitting still on a major highway. Florida feels far away. At least, I console myself, I’ll miss Washington, D.C. rush hour traffic. I hit my Friday night destination of Roanoke Rapids, North Carolina at about 12:30 a.m., two hours behind schedule. I am on the road again at 5:15 a.m., and I think that maybe I have a chance to make the Florida Derby, but given the vagaries—literal and figurative—of road travel, I have to get the perfect trip. Fortunately, there’s an experienced jock at the helm. The hours tick up and the miles tick down. A friend at Gulfstream calls—the races are running about five minutes behind schedule. I check the miles left against the clock—an open lane in the stretch, and I’m there. It’s fifteen minutes to post, and I’m pulling off I-95. I am going to make it. And then, as unexpectedly and infuriatingly as those northern logjams, I get stuck at the traffic light at the corner of Hallandale Beach Boulevard and Route 1. I sit there for literally seven minutes—seven!—as every other lane of traffic gets to move before I do. I’ve travelled 850 miles in a day and I’m going to miss the race because I’m stuck at a traffic light a block away from the track. Green = release, and I go. North parking lot: full. Valet parking: full. Steps away from the entrance, I spy a metered spot, empty, for the shoppers at the Village at Gulfstream Park. Immediately, I am a fan of the new mall. A friend has picked up my credentials, and we meet as the horses walk on to the track. 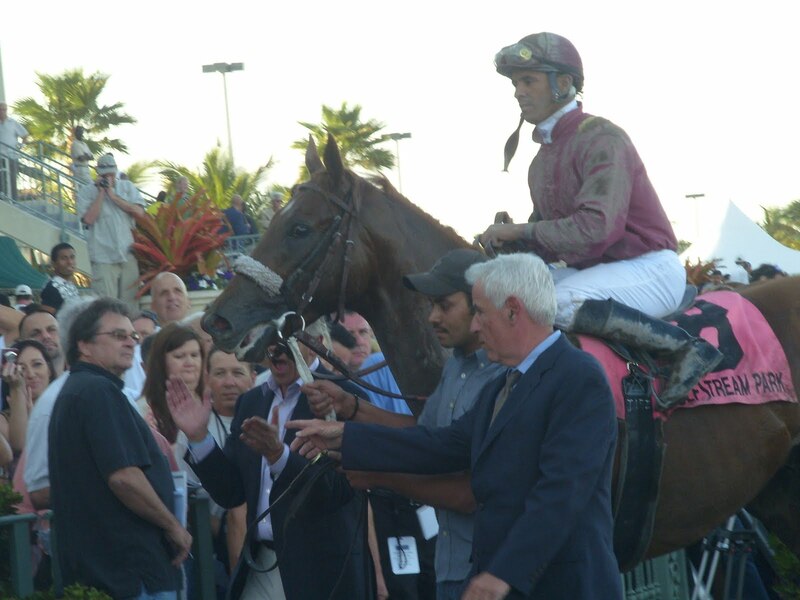 I’ve missed the paddock and I can’t get anywhere near a good spot to watch the race live, but when Nick Zito walks into the winner’s circle with his 2010 Florida Derby winner, I’m there, and the odds of that were far higher than the 21-1 at which Ice Box went off. Congratulations to Nick Zito, José Lezcano, Robert LaPenta, and Ice Box. Jenny: Much better than the Taconic in a hurricane.John, you knew that before now, right? =)WG: The stretch run was rife with decisions: stick to the rail or go wide? Wait for the hole or seek one? I fear that greater scrutiny might have resulted in a suspension, or at least a fine.